The insider advice on this page is from Wendy’s Trusted Travel Expert for Sicily: Marcello Baglioni of Agave Travel Creative. 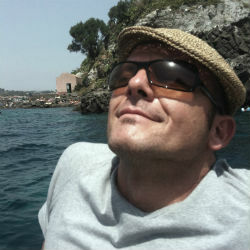 Marcello spends half his time in Sicily, the other half in Los Angeles (where he was born to Italian immigrants). While running a school for Americans studying in Sicily, he found himself planning trips for the students’ visiting families—and thus Agave Travel Creative was born. His own fascination with Sicily derives from the island’s important historic location at the crossroads of numerous Mediterranean cultures (Roman, Arabic, Spanish, Norman, to name a few), all of which left their mark on the region’s unique food, wine, culture, and language. He excels at forging deep personal connections and can arrange a hike up Mt. 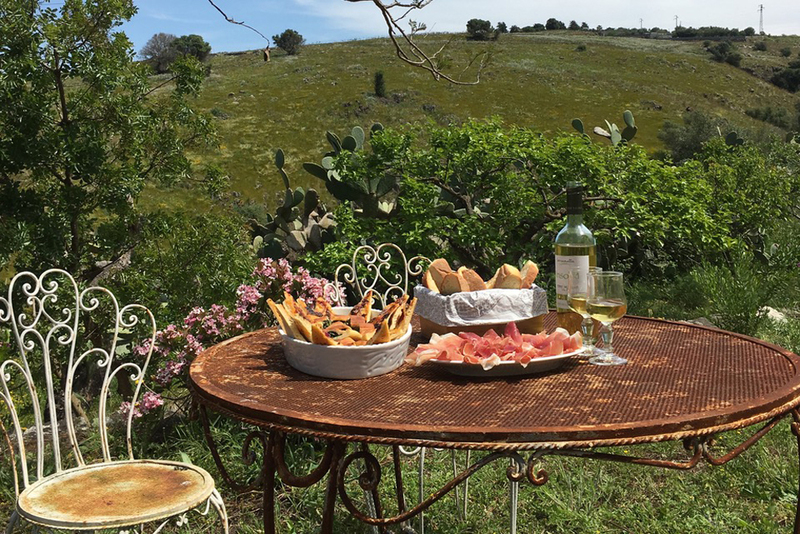 Etna with a volcanologist, a market tour and cooking class with a chef, a visit to Greek ruins with an archaeologist, a private lunch at an herb farm, or a tour on a lovingly restored sailboat, all hosted by passionate locals whom Marcello considers family. From five-star palaces to rustic farm stays, he is so plugged into the hotel scene that he knows which rooms will accommodate a wheelchair or, in the small properties, a late sleeper. Travel arrangements start at $900 per day for two travelers. 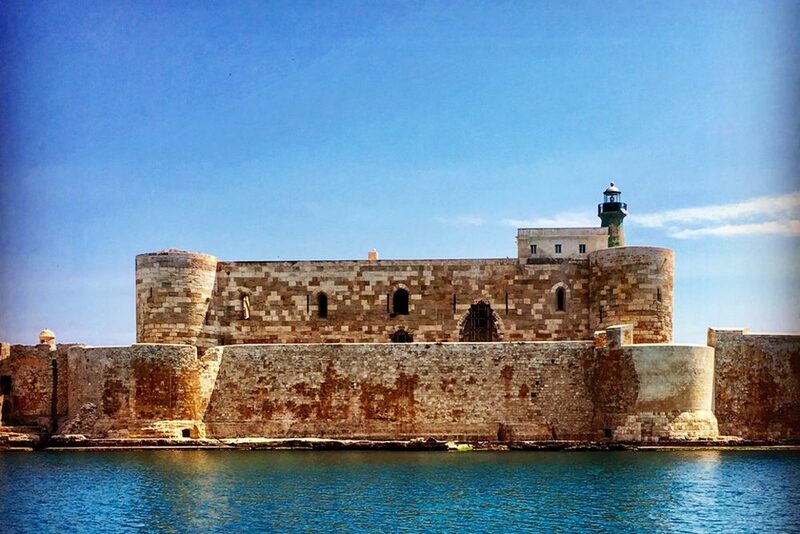 The historic town of Ortigia in Siracusa (or Syracuse) makes for an ideal home base in the southeastern part of the island. It’s a compelling mix of 3,000-year-old monuments, wide-open piazzas where you can relax with nice gelato, outdoor food markets, and an ancient, eminently walkable harbor. 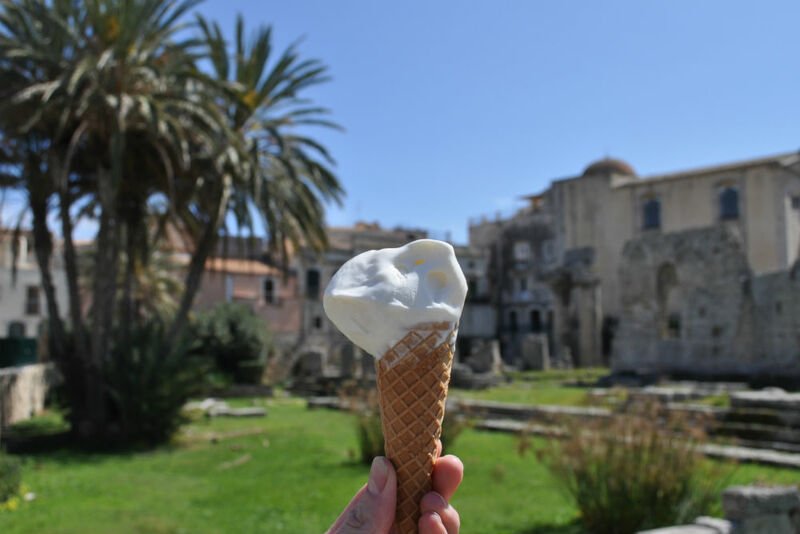 Many tourists make Siracusa a half-day experience: They zip through the archaeological park, walk through the streets of the Ortigia Island for a quick visit to the Duomo, and a bite to eat, then buona notte. Don’t make the same mistake! 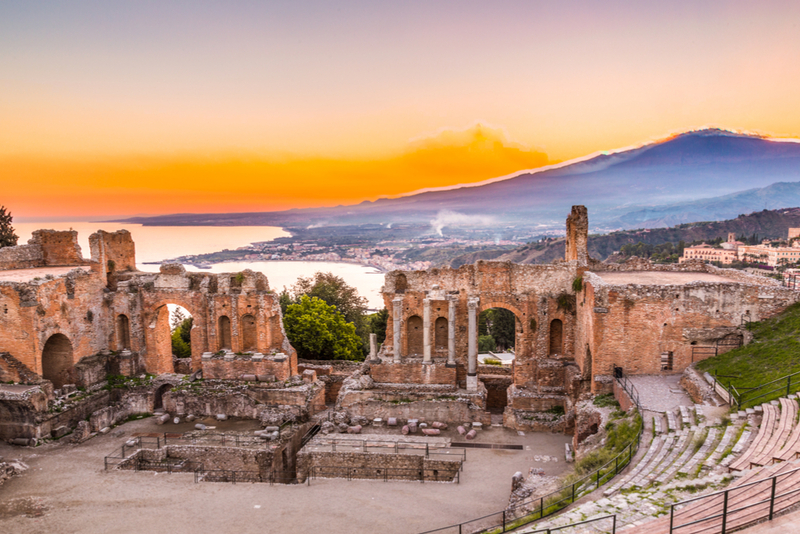 Most first-time visitors want to base themselves in the famous hilltop town of Taormina, which has some of the best accommodations in Sicily. But its tiny streets are constantly clogged with tour groups, leaving you high up in the hills without many places to escape and explore on your own. This sort of base tends to keep you isolated from local life and culture. The southern tip of Sicily has some of the most pristine beaches on the island, and it also happens to be a great area for wine, melons, tomatoes, and fresh local seafood. One of my favorite spots for an evening stroll and dinner is the Marzamemi fishing village. 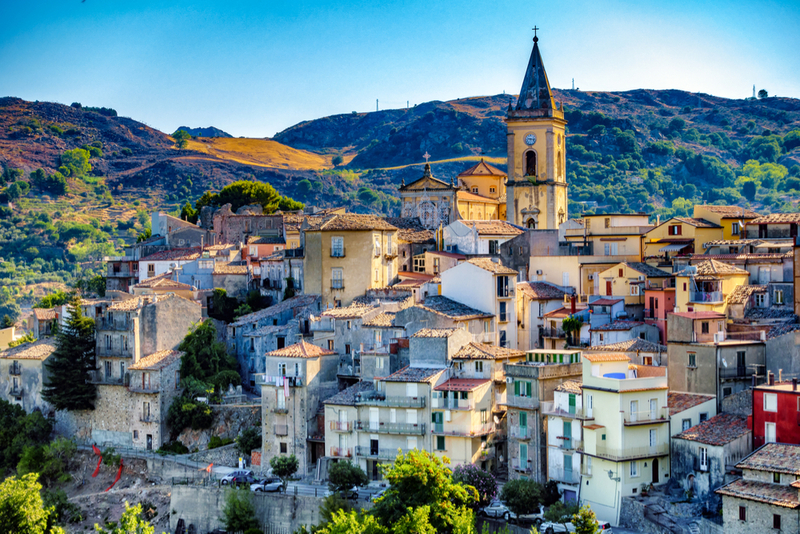 It’s a great place to get a strong sense of what traditional Sicily is all about, especially in the summer when the streets are filled with local families and friends on their evening “passeggiata,” or leisurely stroll. It’s also one of the best spots for gelato in Sicily, so the evening walk is a great way to earn an extra scoop of a new flavor!! The Mandranova Agriturismo, near Agrigento is part working olive farm and culinary epicenter, and part luxury country resort that features elegant/rustic accommodations with locally sourced evening meals that reflect the local style. Being at the Mandranova feels like being in a little olive village, where you’ll be treated like a welcomed and distant family member who has come to pay a visit in Sicily. Monaci delle Terre Nere Hotel, Mount Etna, Sicily. Photo courtesy Monaci delle Terre Nere. 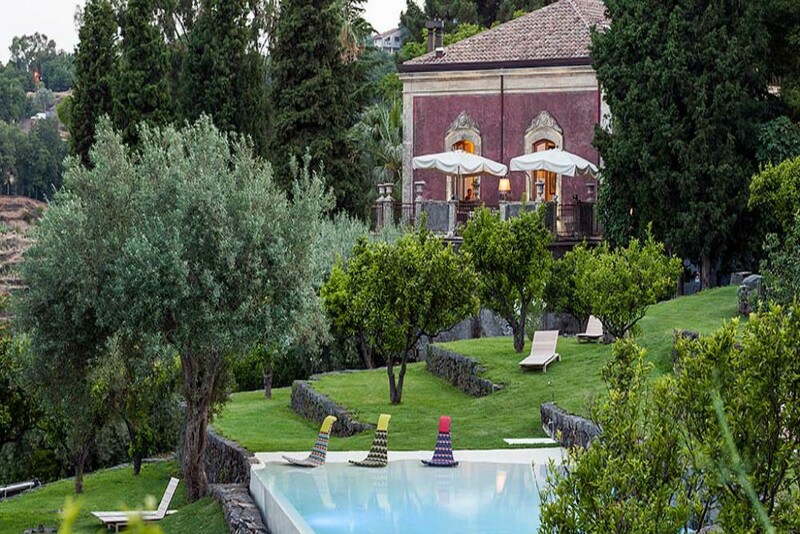 Monaci delle Terre Nere provides luxurious, environmentally friendly accommodations on Mt. Etna — plus breathtaking views of volcanic landscapes, vineyards, and the Mediterranean Sea below. The location gives you a great base to explore the natural beauty of the active volcano, as well as the local food and wine culture of the area. 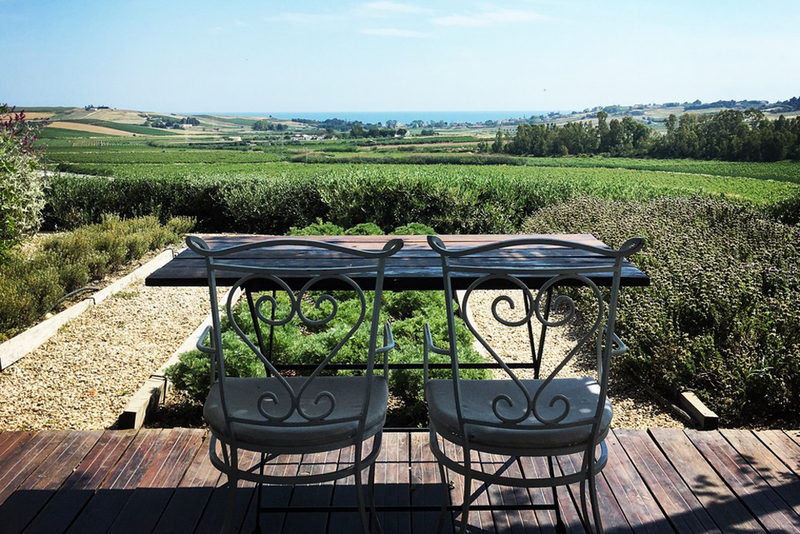 Guests can stay in the central core of the structure or in independent bungalows set amongst wine vineyards all updated and crafted from local stones and materials, with just the right touch of the original structure. Musciara Resort is located just off the Ortigia Historical Center (in Siracusa), with amazing sea views, and a private beach area. I like this place since it is a private oasis to both see and experience the historical center. You can be part of local life but are just detached enough to get a peaceful perspective on the ancient city and sea. The spaces have been hand-crafted by the owners and provide for a unique, spacious and joyful stay. 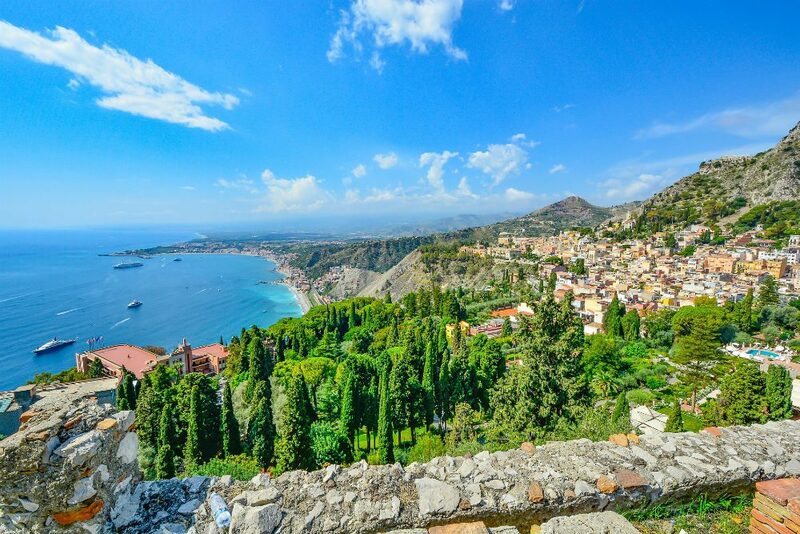 Taormina can tend to get quite overrun with tour groups and leave you feeling at times as if you were in a Sicilian Disneyland. The Ashbee Hotel is set within the context of an English villa, an oasis just outside the main area of town that gives you access to the ancient ruins and rich local history, breathtaking views, and culinary gems while still being able to retreat to a private space where you can process the journey in peace, tranquility, and all the luxury that Taormina is famous for. Buatta Cucina Popolana, Palermo. Sicily’s capital is known for its street food and Buatta does a great job of riffing on the standards (including chickpea fritters and rice balls) while also offering contemporary takes on traditional dishes. Taverna Cialoma, Marzamemi. In a sleepy old fishing village, this simple restaurant couldn’t feel more local. Tables overlook the Mediterranean, the fish is as fresh as can be, and the wines on offer—made at nearby wineries—are considered some of the best in Sicily. Pierrot, Castelvetrano. Few tourists take the time to explore this remote and rustic corner of western Sicily, but those who do are well rewarded for their efforts. The pizzeria Pierrot, near the ancient Greek ruins of Selinunte, has a wood-burning oven in the center of the restaurant, where the chef will grill just about anything from a simple tomato pizza to fresh swordfish and locally grown artichokes. “Pasta con le Sarde,” or pasta with anchovy filets. It is often made with wild fennel, fresh anchovies, raisins, pine nuts, and finished off with some toasted breadcrumbs, although each province in Sicily has a slight local variation. 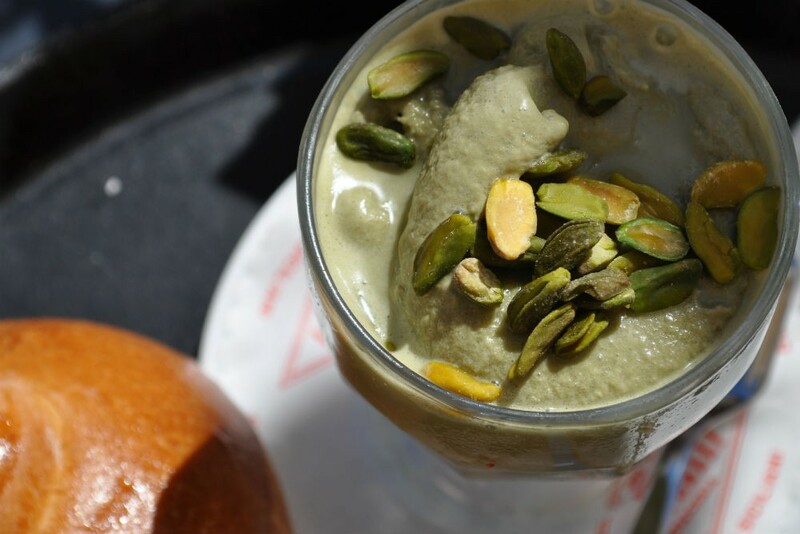 The dish features a contrast of seemingly conflicting flavors that somehow come together on the palate, giving you a strong sensorial sample of the culinary and cultural mosaic that is Sicily. April. The air is fresh and spring flowers abound. Easter week, when colorful processions take place all over Sicily, is a famously popular and festive time to visit. May to early July. The weather and the sea are warmer by the week, while the heat, humidity, and crowds don’t usually arrive until later in July. September to mid October. September is still summer weather, though if you wait until after the first week of the month, most of the crowds will have left. Swimming, sailing, and any outdoor activities are great until the second and even the third week of October. The end of September and first ten days of October are typically harvest time (for olives and wine), which means any number of harvest festivals. November to December. The weather gets colder, but the various feast days of saints, celebrations, and food festivals enliven the towns and keep things warm. Culture never gets cold, so the sites, ruins, and culinary traditions are always in season. However, from just after the New Year’s festivities until the start of the Easter holiday, most Sicilians go into a sort of hibernation, and the weather is somewhat unpredictable. People think of Sicily as a small island that can be seen easily in just a few days to a week. Don’t be fooled by Google Maps: It takes several hours to cross from one side of the island to the other. For shorter holidays, base yourself in one spot and don’t try to see or do too much. I think that seeing less and experiencing more is always a good rule of thumb. If you have a week to ten days, I suggest starting in Palermo, making your way through the heart of Sicily to the southeastern part of the island and departing from Catania. If you have two to three weeks, add in the Wild West of Sicily (Trapani, Marsala, and Menfi), or a few days in the Aeolian Islands. Taxi drivers at both the Palermo and Catania airports tend to price their fares according to the weather, early or late hour of flight arrivals, or even their moods. We suggest either renting a car or arranging for one our trusted private drivers to provide the transfer service in relaxed comfort. Tipping is not expected of locals, but it is somewhat expected of foreigners though well below the 15 to 20 percent range. If a bill comes to €36.50, you might just leave €40, or a couple of euros. For a coffee or gelato, leave no more than 50 cents. A pair of walking shoes or cross-trainers will prove invaluable when you’re walking around all of the archaeological sites, which usually feature uneven and rocky terrain, as well as for Mt. Etna. All of our drivers, guides, and office staff uses WhatsApp to communicate, so it’s a great way for you to stay in touch with all of us en-route as well. If you are in Sicily during the olive oil harvest, you can visit one of our friend’s local olive farms, pick some olives, and have them pressed into your very own oil to take back home. A local wine makes a great gift too, particularly since many of the best Sicilian varieties aren’t sold in the United States. You can also pick up some aged salted ricotta cheese in the outdoor food market and have it vacuum packed for the voyage home, using it sparingly over your Pasta alla Norma (a local recipe made with red onions, tomato sauce, and fried eggplant). Visit an ancient ricotta cheese-making farm in the Noto area (about 45 minutes outside of Syracuse). Meet Concetto on his family-run farm, see the animals, learn how to make fresh ricotta in a traditional style, and enjoy a homemade meal together. Concetto’s land is also surrounded by an almond farm that features the three kinds of almonds that are cultivated in Sicily; you’ll also learn about how each nut has its own specific use in the Sicilian culinary tradition.